I visited Boston for the third time in the fall of 2017, for a weekend trip. Though I was too early for the colors of fall to have really kicked in re: the foliage, I had my ample fill of Boston eats, sights, and more in this college city. Shabu and Mein is a local favorite for hot pot and ramen (its namesake dishes). 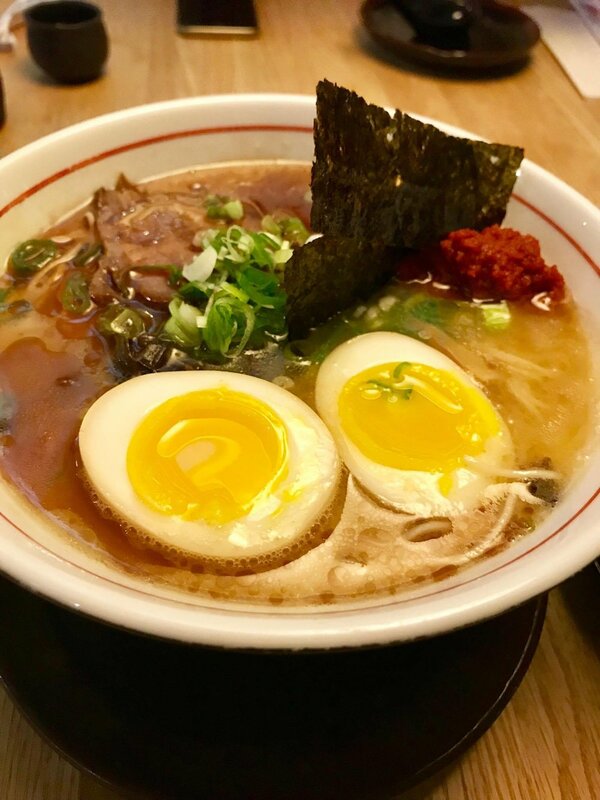 On the edge of Cambridge, I opted for the ramen on my first night of arrival into the city. Day 2 began with...well, more food. A definite favorite in Boston, Flour Bakery has several locations around town. Their store in MIT area was packed on the Saturday morning. Can't go wrong at this popular joint - opt for a filling breakfast egg sandwich or one of their award winning 'sticky buns.' 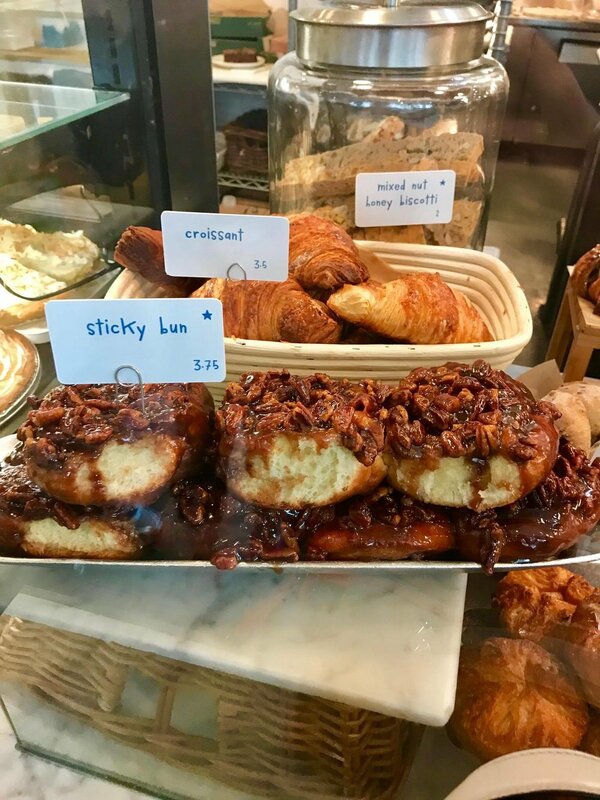 Glazed with an inordinate amount of pecans and caramel, come early for this popular pastry at Flour Bakery. I've been here later in the afternoon only to have them run out, definitely worth a try if you're in town. Finally - a non-food related activity. The famed D.U.C.Ks of World War II that provide tours around Boston can be seen around its streets on any given day. With three departure locations, the tour is a good way to get one's bearings around the city, and great for those who want to experience an amphibious vehicle. No matter your departure location, the tour will begin with a ride through the city, with your guide pointing out some of the more popular tourist attractions around town. The most exciting moment of the tour is naturally when the vehicle hits water and begins to function like a boat. Charles River is the main river that runs through Boston. From this vantage point, the picturesque city skyline is clearly visible in the distance. If you're lucky, you might even get to see...crew practice. 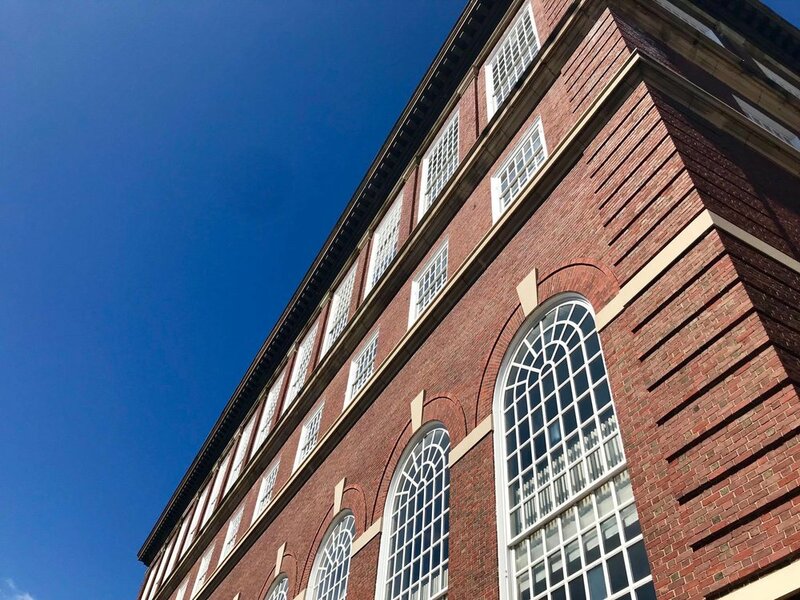 With 35 universities and colleges in the greater Boston area, institutions of higher education is something the city isn't short of. One stands out amongst the rest, and around the world. I'm talking about, of course, Harvard. The statue of 'John Harvard' in Harvard Yard (seen above) is not actually of the man himself. All likenesses of him were stored in a building that was destroyed in a fire on campus, and the jury is still out on who sat for the statue to be cast. Rumors of a descendant, a student, and a former dean of the school are popular theories. It seems that Mark Zuckerberg's freshman year dorm has become a stop on the campus tour. Behold the building where he initially built the Facebook.com, as it was then called. Time for some food! 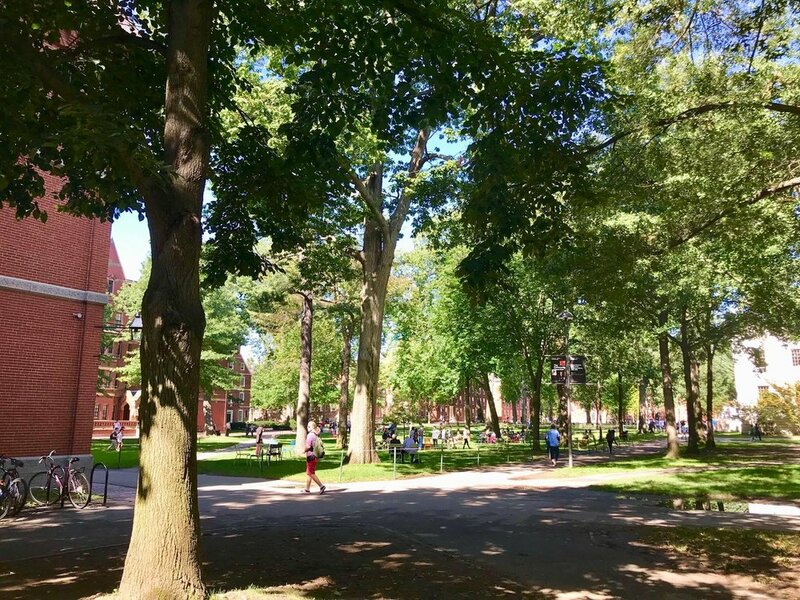 A student favorite for fro-yo on campus, Berryline is rumored to have some of the best icy-treats this side of the Charles River. Don't let its simple exterior fool you, the store's all natural concoctions are a delicious way to cool off on a hot fall day. Mike's Pastry has been known for their cannoli since 1946. Dazzled by the myriad of choices now offered in their 3+ storefronts across the city, I opted for a simple but decadent chocolate chip cannoli - one of their more popular choices. So. good. 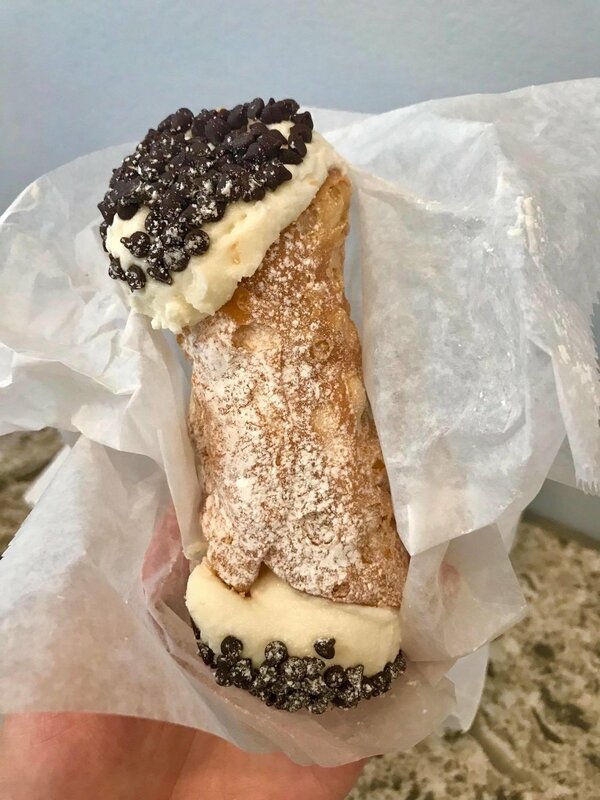 Aside from their ever-popular cannoli, the store also offers up a wide selection of pastries sure to satisfy any variant of a customer's sweet tooth. The store is located just off the main junction of Harvard Square - a busy tourist attraction on any given day. Funnily enough, on the way to Mike's we walked right by Malia Obama, who was then a freshmen at Harvard College. Newbury Street is world renowned for its shopping. You'll find everything from Chanel to Pinkberry on this avenue. Nearby is another famed destination - the Boston Public Library. The first free municipal library in the United States, today this landmark is also prized for the grandeur of its architecture and design. The interior of the library is remarkably picturesque. Worth a quick trip if one is in the area. Bates Hall is comparable to New York Public Library's famed Rose Reading Room. One would imagine this would be a great place to study. There is also a courtyard in the midst of the library - note that on most days, its closed by 5 or 6PM, so be sure to check hours ahead if you go. Day Two started at the Freedom Trail, a hallmark route of Bostonian tourism. One can easily follow the train by the patterned line of bricks that stretch along the 2.5 mile journey. Beginning in Boston Common, the stroll will take you past many historical landmarks such as the Paul Revere House (statue of Paul Revere below), the Old North Church (seen in background below), and eventually to Bunker Hill. A musical instrument that I no longer recall the name of, comprised of notes expertly formed by this lady from the ringing created on the rims of layers of glass bowls stacked together. The trail also leads into Boston's oldest district - the North End. Full of historical architecture and a variety of eateries and shops, the area makes for a great mid-morning stroll. Bova's Bakery in the midst of Boston's North End has been serving the city's denizens since 1932. Family owed and operated to this day, its open 24 hours and a local favorite from day into the wee hours of the night. Whether its sweet or savory, this bakery has something to offer everyone. Stop by for a freshly warmed sausage calzone (left) or lobster tail (right). Of note, the lobster tail was layers of crispy pastry puff filled with a delicate, light whipped cream. A heavenly balance of crispiness and a sweet, umami filling, I'll be looking for this back home in New York. Speaking of food, Union Oyster House is one of Boston's, and America's, oldest continuously operating restaurants. In business since 1826, this famed eatery serves up its namesake mollusk and a variety of other fresh seafood, and a mean clam chowder. As in, probably some of the best I've consumed, ever. And I've in coastal cities my entire life - so that's saying something. The restaurant's interior is very much reminiscent of its multi-century legacy. A glass tank filled with lobsters: something that one rarely sees outside of a Chinese restaurant. Order up a 2 pounder, or, catch your own? Get oysters, littleneck clams on the half-shell, a classic that they prepare right on ice in at the counter. While I'm always a glutton for oysters (or maybe in general), I found these ones to be somewhat lacking in flavor, and a few had a gritty aftertaste (read: sand). Next up, some grilled oysters topped with a cheesy concoction. Though cooked, these had the same gritty, sandy problem encountered with the raw ones. Though oysters may be their namesake, it definitely isn't their best dish. Now for the highlights: the aforementioned clam chowder. It may not look like much, but a spoonful of this creamy, delightful potage is ecstasy. You can count on not stopping after one bowl (we didn't). Next up: the lobster. Now this. was. good. The breadcrumbs they baked this with coated the juicy, tender chunks of lobster with seamless perfection. Get the larger of your options. You won't regret it. Honorable mention for the fries as well, fried to crisp perfection. Though it naturally pales in comparison to the star of the dish. Bunker Hill, an enduring landmark for the city of Boston. Hard to capture in one photo but seen here in all its glory. Bunker Hill being a national park and all, you can access the top of the memorial for free. Beware though, the climb (270+ stairs) is a harder climb than it seems. No joke, it was painful. The view from the top on a clear day is somewhat worth it. Decide for yourself. Last stop on the trip: Toscanini's Ice Cream in the heart of MIT's campus is definitely worth a try if you're in the area. Any parlor claiming 'the worlds best ice-cream' is sure to be up against some tough competition. Toscanini's might just be able to hold its own. On a hot Sunday afternoon, expect no less than a 30 minute wait for their award-winning scoops. Finally, the main attraction. As someone who is partial to any 'sweet cream' flavor at any ice-cream store - I have to say this was one of the best I've had. Peanut butter chunk was also delicious, as was cookies and cream (left) albeit a bit on the sweet side. Verdict? Definitely a contender worthy of its many awards. And on that note, it was time for a brief walk around the MIT campus (no photos because I was too busy pretending to be a student, just trying to re-live the good old college days, okay?). Finally, the trip to Boston ends with some pizza at the South Station. Souvenir for the train-ride home, anyone?